TEDxNitteUniversity- Simple Ideas Can Make A Difference, a much-awaited event that presents captivating ideas and inspiring speakers before the audience is all set to be hosted at K.S Hegde Medical Academy Auditorium, Mangalore on 27th August 2017. TEDxNitteUniversity aims to provide you a lifetime experience through brilliant orations and mesmerizing performances that have the potential to change the way you perceive your goals. Listen to Dr. Arvind Bhateja speaking about his community initiative ‘Giving Back’ campaign @ TEDxNitteUniversity. 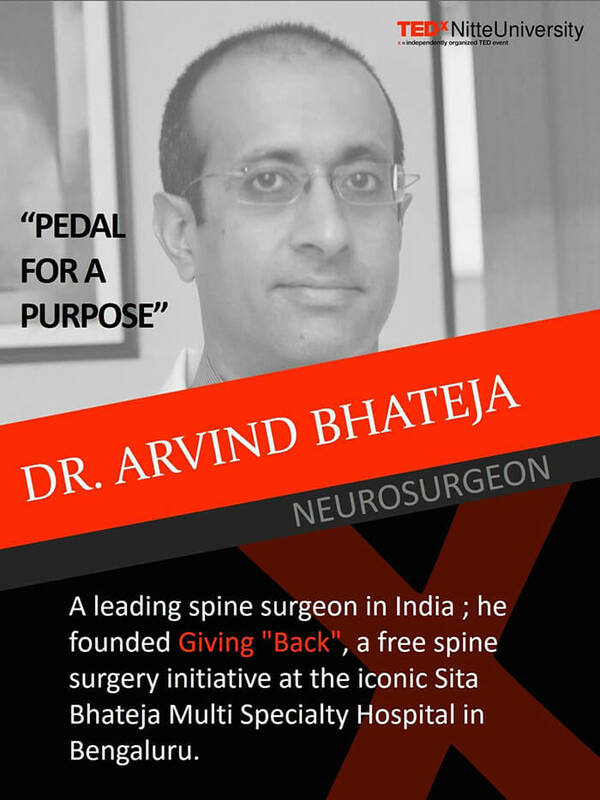 ‘Giving Back’ campaign is a free spine surgery initiative by Dr. Arvind Bhateja, leading spine surgeon at Sita Bhateja Multi Speciality Hospital in Bengaluru. Dr. Bhateja has performed around 100 free spine surgeries till date for low-income groups through his cycling campaign ‘Give Back’. He has been awarded the ‘Rashtriya Rattan Award’ by the Global Economic Council for his impressive range of accomplishments including participation in Iron Man 70.3 Triathlon in Singapore, Race to the Sun in Hawaii and 2 editions of BSA Tour of Nilgiris.